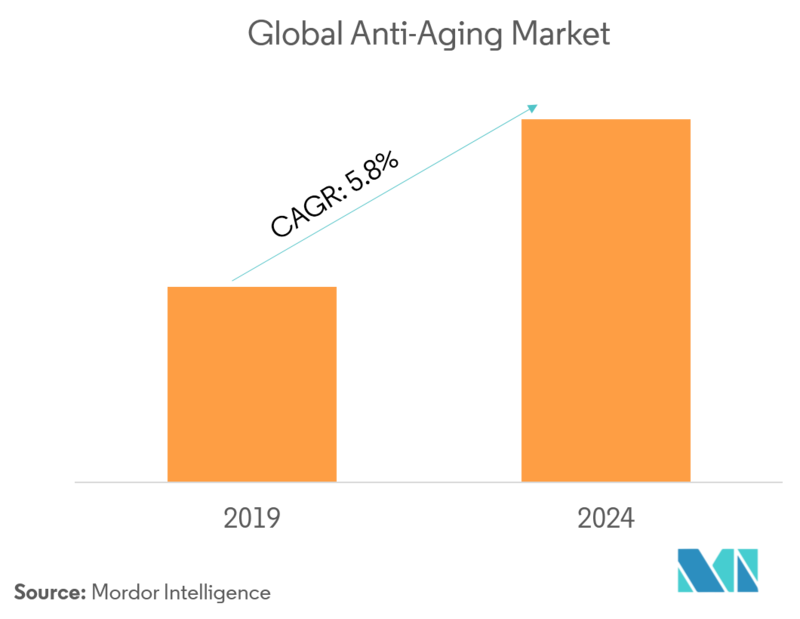 The global anti-aging market was estimated to experience a robust growth in the forecast period. As of 2017, North America, followed by Europe and Asia-Pacific, held up to 60% of the market share. Growing aging population worldwide, increasing number of medical tourism for cosmetic procedures, rising consumer demand for anti-aging products, are the other factors driving the market. Moreover, these factors have led to the introduction of safe and efficient anti-aging products and services in the market. With the rising beauty consciousness among people, there is a potential market for anti-aging devices and aesthetic plastic surgeries. According to the American Society for Aesthetic Plastic Surgery, in 2014, Americans spent around USD 8.5 billion on cosmetic procedures. Nearly total of 28,315 cosmetic procedures were performed in the United Kingdom, in 2017. However, factors, like stringent regulatory environment, is restraining the market growth. Skin aging is a complex biological process influenced by a combination of endogenous or intrinsic and exogenous or extrinsic factors. Because of the fact that skin health and beauty is considered one of the principal factors representing overall “well-being” and the perception of “health” in humans, several anti-aging strategies have been developed during the last years. The scope of the market includes the anti-aging products and services used for the aesthetics in the aging process. Anti-wrinkle products dominate the market, accounting for the majority of the total share. Wide range of anti-aging products are available in the market for different needs of the consumers. 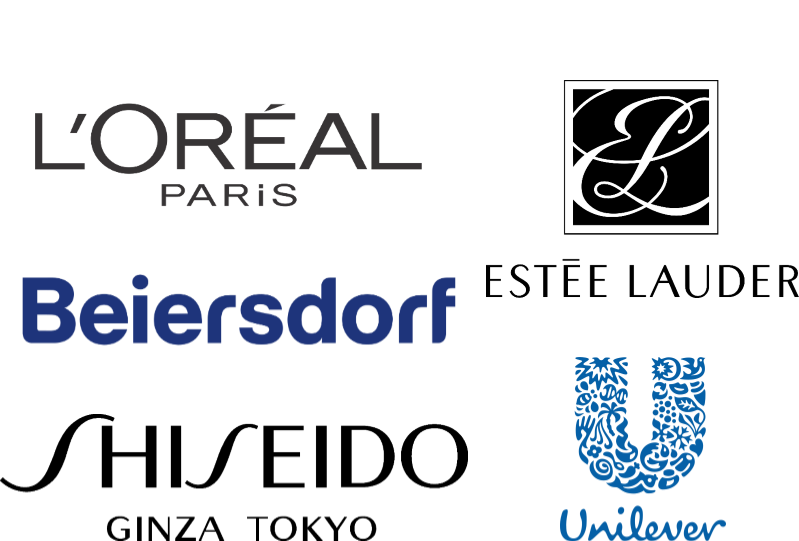 Currently, anti-wrinkle products dominate the market, accounting for the majority of the total share. 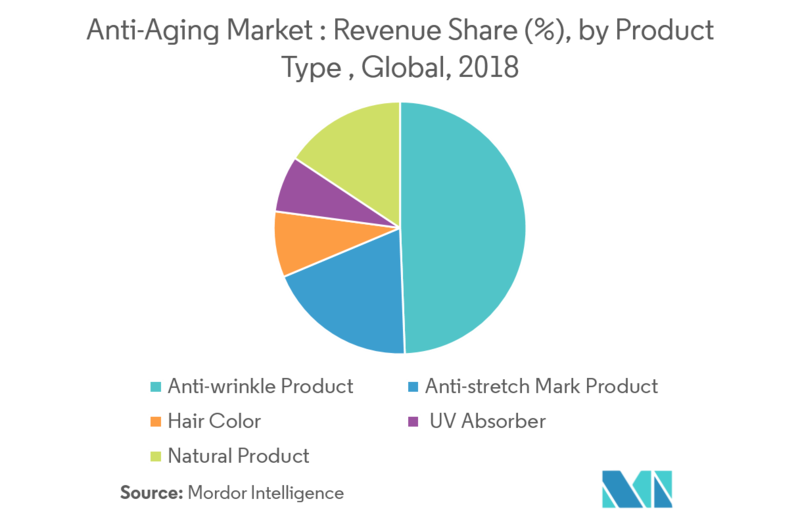 Anti-wrinkle products segment accounted for the largest market share and is expected to reach experience robust growth by 2024. The natural products segment is anticipated to witness the highest growth rate, due to the side effects associated with cosmetics and chemical-based products. The demand for different types of anti-aging products and services has been growing since the past years. Based on type of devices, radiofrequency is expected to lead the anti-aging market, during the forecast period. Factors such as an increase in the aging population and increasing prevalence of skin photo aging are the major driving force of the market. 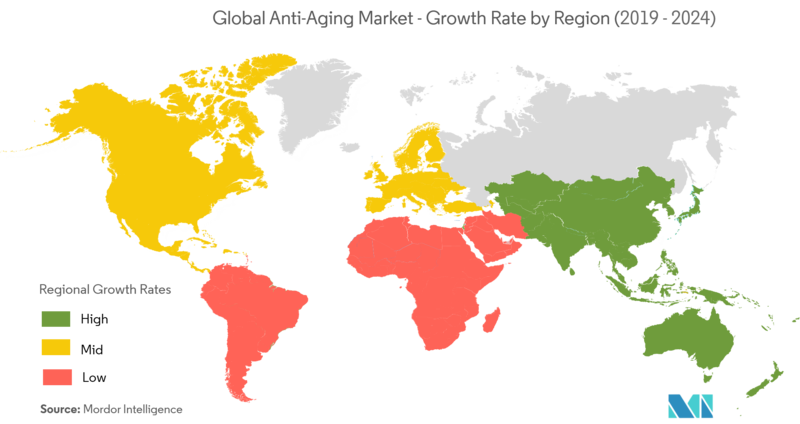 North America holds the largest share in the anti-aging market during the forecast period. On a geographical front, surging incidences of sedentary lifestyle and rising concerns regarding signs of aging are envisioned to set the tone for the North America anti-aging market. Owing to which, North America could take command of the global market in terms of share. The United States accounts for the largest share in the global anti-aging market followed by Japan, France, Brazil, Germany, China, South Korea and Italy this is due to the high consumer awareness regarding anti-aging products. Japan is becoming one of the established markets for the anti-aging products & services, because of the modern lifestyles of Japanese populace. Countries, like the United States, and regions, like Europe and Australia, are also a few leading markets, globally. The Japanese anti-aging market is evolving because of the new product introductions and services being provided Japan has been the world’s longest life expectancy for women for more than two decades. There is a huge competition in the anti-aging market. 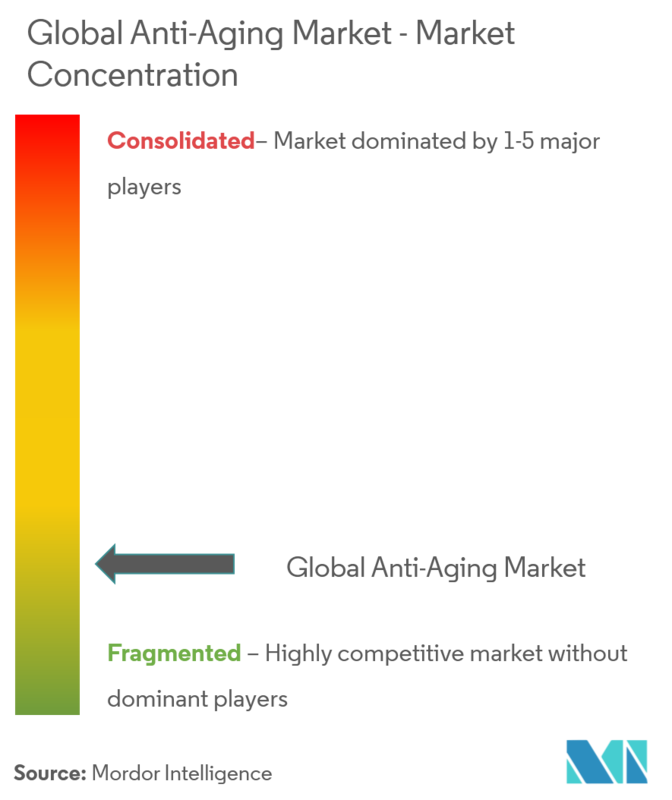 With the presence of many domestic and also international market players, it is a complicated for a company to survive in the global anti-aging market. Most of the market players are adopting various growth strategies such as acquisitions, partnerships, new product launches in order to survive in the market. For instance, in January 2018, USANA announced the launch of a new skincare line in 2018 Celavive, to reduce wrinkles. In January 2018, Vernell launched Cellifique, its new anti-aging gel for men that promises excellent skin revitalization and firmness. In September 2018, Syneron Medical Ltd. acquired Ellipse A/S, company that manufactures and markets laser based and intense pulse light (IPL) platforms for different types of medical and aesthetic skin treatments.